Adding to the stunning natural scenery of Algonquin Park-Muskoka and the increased buying power of the strong U.S. dollar, the tourism organization for the popular getaway region is sweetening the pot by offering international visitors $200 CDN in gas and attractions vouchers. The Fuel & Fun Package from Explorers’ Edge can be used by international visitors to Canada who book a stay in the region between September 7 and October 31, 2018 at participating accommodations. The package includes $50 gas cards plus $150 worth of cash vouchers to spend at participating attractions, restaurants and shops in the area. To be eligible for the Fuel & Fun Package, visitors have until August 30, 2018 to book a minimum stay of two nights at over 50 participating lodges, resorts and accommodations. Once the booking is complete, travelers simply need to register with their confirmation number on the Great Canadian Wilderness website to claim their gas card and vouchers for more than 120 exceptional tourism businesses, including attractions and eateries. The packages will be waiting for registrants upon check-in. As one of Canada’s oldest and best-known vacation destinations, the region has been welcoming travelers for more than 100 years to charming resorts, B&Bs and hotels that dot its beautiful waterways. From Algonquin Park in the east (Canada’s oldest provincial park) to Georgian Bay in the west (a UNESCO-designated Biosphere Reserve), visitors who stay in these parts relish especially their days in, on and beside the lakes. It’s not all about roughing it, either. While there are plenty of opportunities to completely unplug and get off the grid, the region is also recognized for vacations that offer a ‘pampered wilderness’ experience, allowing travelers to dip in and out of the wild, and then retreat to fine accommodations afterwards. In addition to checking out stunning fall colors and ruggedly beautiful landscapes, there are numerous other activities and adventures to thrill visitors. Take an adrenaline-filled ATV tour into the woods and onto the rocks of the Canadian Shield to feel the rush that comes from exploring terrain not accessible by foot. Take a guided tour by paddle or kayak over stunning lakes and rivers for some of the best fresh water paddling in the world. Or simply relax on one of many iconic docks in the region. Getting to the area is simple — it’s just two hours from Toronto by car and another hour further from Niagara Falls. International travelers arriving to Ontario via Toronto’s Pearson International Airport or Billy Bishop Toronto Island Airport can find numerous options for car rentals, bus transportation and even charter flights to the region. 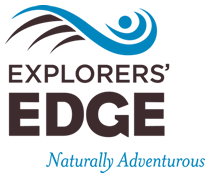 Explorers’ Edge is the regional tourism organization for Algonquin Park, Muskoka and Parry Sound on Georgian Bay that is funded by the Ontario Ministry of Tourism, Culture & Sport. Visit their site for international visitors at www.thegreatcanadianwilderness.com and their domestic site at www.explorersedge.ca. Follow them on Facebook.com/greatcanadianwilderness.